ACRE is a ministry that is providing teaching and training for ministers in the Kenya. The approach is geared to giving solid Biblical teaching to individuals who want to become preachers and those who are alady preaching. There is little training available to the Kenyan people so ACREhas been very successful in attracting interested students. It this point ACRE has taught 4 classes with another scheduled this summer. Benard is ministering to adults and children in Kenya. He has a twofold ministry. One focal point of the ministry is to provide food, clothing, and schooling to the children of Bungoma, Kenya. 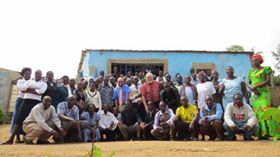 The second area of ministry is being an evangelist for numerous churches in his area of Kenya. Campus Christian Fellowship is a campus ministry located on the campus of Appalachian State University in Boone, North Carolina. Jessica Lup is the International Student Minister. She works with leading Bible Studies, group worship, personal Bible studies, and leadership training. This great ministry helps families who are faced with difficult decisions dealing with pregnancy and family life. In the past year Citrus Pregnancy was able to be involved with the birth of 122 babies. They help in providing sonograms, counseling, clothing, baby items, and prayer for those who come to the Center for help.